Dean Whitehouse will be the man in charge when Leeds United travel to Blackpool on Tuesday night. The Northampton official as taken charge of two games already this season, showing 7 yellow cards (3.5 per game) and 1 red. Last season he was in charge of 35 games, showing 106 yellow cards 3.02 per game) and 6 reds. His last game in charge of Blackpool was in March when they defeated Southampton 3-0 at Bloomfield Road. 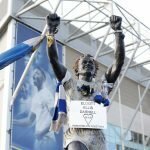 The last time he was in charge of Leeds was during the 2010/11 season when they were defeated 2-1 at home by Leicester City.